The comprehensive time-tested knowledge of Maharishi AyurVeda provides the basis to give every family the best start. Topics include: preconception guidelines to maximize fertility and fetal health, month-by-month guidelines for pregnancy, strategies to facilitate labor and provide the ideal environment at delivery, and postpartum care guidelines for both parents and newborns to ensure the fullest recuperation for mothers and a healthy beginning for every family. Materials fee: $30. Prerequisites: PH 262 or equivalent and either PH 263. Effectively running a health care practice requires the ability to apply a wide range of skills and expertise, including team work in collaboration with other health care providers, representing modern medicine and a variety of alternative approaches to health. It also requires knowledge of human resources management, networking, social media and modern marketing practices. In this course students will create a business plan which will reflect their ideal of a working clinic. It will forecast costs and revenues from their business and outline how it meets all laws governing health related activities. This course will help students to clearly envision their objectives and be confident in starting and managing a successful and enjoyable practice. Topics include: means for secure handling of patient records, finding locations that bring the most traffic, evaluating the costs and benefits of various clinic types, exploring marketing options including social media and presentations to media and the public; insurance, payroll, and financial requirements. During this course students get practical experience of the knowledge gained in all the previous courses in Maharishi AyurVeda, and build confidence in consulting with clients, family, and friends to guide them to higher levels of health and wellness. In the clinical setting, students take turns leading consultations and participate in discussions of case studies under the supervision of experts in Maharishi AyurVeda and modern medicine. By the end of the course, students are required to complete their major capstone project, consisting of a reflection paper and a portfolio of case studies based on at least 50 clinical encounters (including observation, student/client encounter with direct supervision and one-on-one cases). May be repeated for credit up to four times with the permission of the department Academic Advisor. Prerequisites: PH 263 and either PH 430 or PH 352. Note: The course is designed to provide practice of how to advise others in developing a personalized approach to health and wellness based on the principles of Maharishi AyurVeda. Regulations regarding health care practice and professional licensure standards vary by state and country. Course participants should be familiar with the laws of the jurisdiction in which they intend to be active to ensure that the scope of their activities does not violate regulations regarding health care practice. 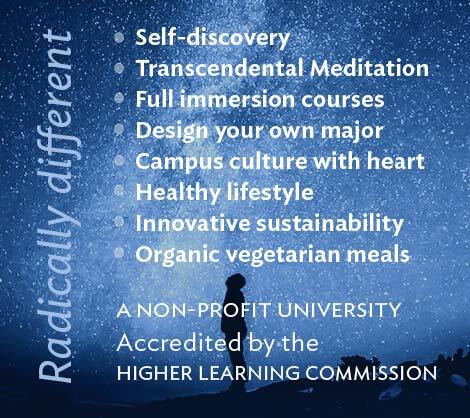 Becoming a Maharishi AyurVeda Wellness Consultant does not confer professional licensing status and Maharishi University of Management makes no representations regarding its economic or other value. Note: Students may fulfill all or some of their requirements for biology by having completed equivalent undergraduate coursework at an accredited university and earned a grade of “B-” or higher. Undergraduate degree students can apply transfer credits to cover the general education requirements, electives, and up to half the coursework in the major for a maximum of 90 total credits. During this course students get practical experience of the knowledge gained in all the previous courses in Maharishi AyurVeda, and build confidence in consulting with clients, family, and friends to guide them to higher levels of health and wellness. In the clinical setting, students take turns leading consultations and participate in discussions of case studies under the supervision of experts in Maharishi AyurVeda and modern medicine. By the end of the course, students are required to complete their major capstone project, consisting of a reflection paper and a portfolio of case studies based on at least 50 clinical encounters (including observation, student/client encounter with direct supervision and one-on-one cases). May be repeated for credit up to four times with the permission of the department Academic Advisor. Prerequisites: PH 263 and either PH 430 or FOR462.Note: The course is designed to provide practice of how to advise others in developing a personalized approach to health and wellness based on the principles of Maharishi AyurVeda. Regulations regarding health care practice and professional licensure standards vary by state and country. Course participants should be familiar with the laws of the jurisdiction in which they intend to be active to ensure that the scope of their activities does not violate regulations regarding health care practice. 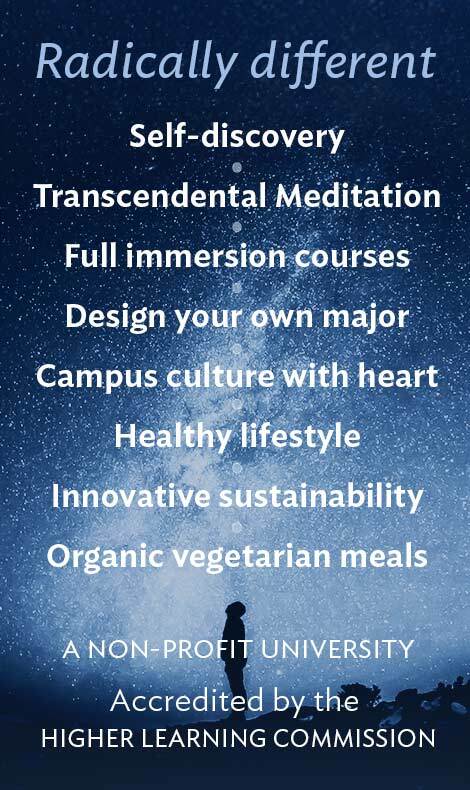 Becoming a Maharishi AyurVeda Wellness Consultant does not confer professional licensing status and Maharishi University of Management makes no representations regarding its economic or other value. Interest in alternative health care, prevention and natural healing is growing. People coming to a health counselor in search for help are usually those who recognize the need for a different way of maintaining their health or can’t find relevant help from a conventional medical professional. An effective health counselor focuses on possibilities instead of problems, emphasizes well-being and strength-based thinking, and establishes relationships with the client characterized by warmth, respect, genuineness, concreteness, and empathy. This course teaches how to establish trust and cooperation with a client, how to inspire and encourage clients to accomplish their health goals. Topics include: professional conduct and ethics; core communication skills; positive psychology approach in counseling; motivational interview; goal-oriented counseling. Role-play exercises provide students an opportunity to practice earned communication skills, and interview techniques and approaches.